This yacht was designed by W. Fife in 1909 and built in Finland by the well known yard Abo Batvarf in 1910. Fife's records show the yacht was for a Mr Soderman, but her first appearance in Lloyd's Register is in 1911. The owners by then were the Tallberg family; the yacht had been raffled by Nyland's Yacht Club and won by the three year old Lucy Tallberg, hence the name. 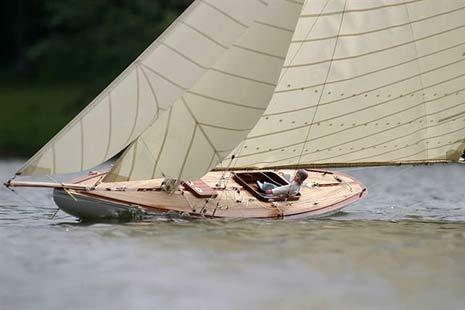 The girl's father then won a bronze medal in the 1912 Olympics; the first Olympic sailing medal for the new Finland There are two sets of drawings for the yacht, the later ones showing the addition of a deckhouse. It appears that the yacht was built with a flush deck, but by the Olympics of 1912 she had a deckhouse.